Pipsqueak is a pygmy goat who was in need of a family. 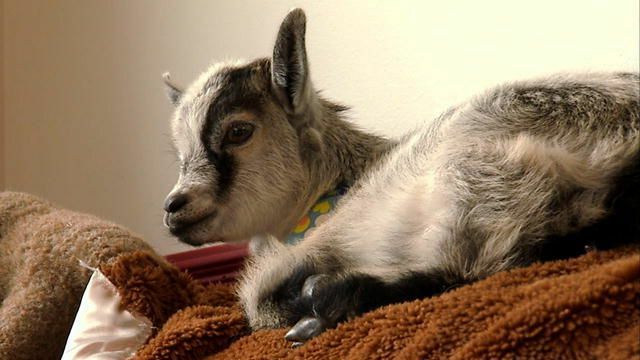 She was too young to be kept with the adult goats and had no other playmates her age. Then she was "adopted" by two farm dogs who had just had a litter of puppies. Pipsqueak tried to fit in with her new brothers and sisters right away. Unfortunately, the puppies were still a little too young to play with, and they were very confused by Pipsqueak's enthusiastic introduction. It is normal for kids to express happiness and excitement by headbutting. 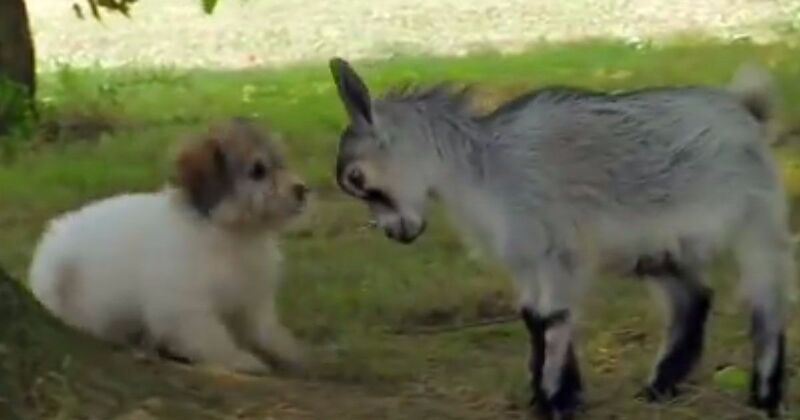 That's how goats play with other members of their families. Understandably, this is not how puppies play together, and so they were unsure of how to view Pipsqueak at first. Pipsqueak just wanted to make some friends. 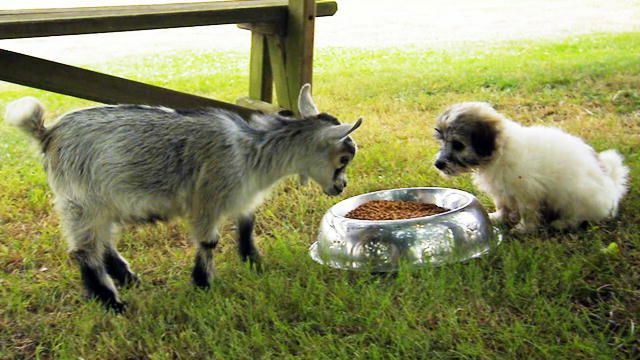 She treated the puppies like she would other goats and didn't intend to hurt them at all. A few weeks later, both Pipsqueak and the puppies were a little bigger, and Pipsqueak tried once more to be worthy of the puppies' friendship. They still weren't convinced by her, until the shyest puppy, named Snowflake, walked over to Pipsqueak and indicated that she wanted to play. Very quickly, these two became best pals, and Snowflake was more than willing to look beyond Pipsqueak's head butting gestures. The rest of the puppies saw Snowflake and Pipsqueak having a great time and realized that maybe they were wrong about Pipsqueak. Soon enough, all the puppies were engaging in play with this now beloved and accepted pygmy goat. We're so happy to see Pipsqueak surrounded by furry friends! Watch the video below of how she won the puppies over, and then share the love and laughs with your family and friends on Facebook.